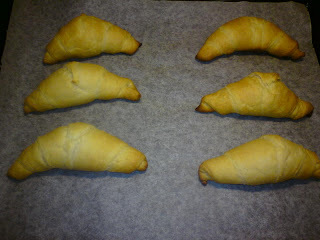 All The World's A Fomite: My first batch of croissants! My first batch of croissants! I've never tried making puff pastry before because it just seemed too complicated. It turns out I was wrong. These croissants took less than 30 minutes to make from start to finish. Isn't that impressive? How could I refuse chocolate at 80% off? This soup better be magical for real! Stress relief or cure for boredom? Dylan McKay, is that you?